A close-up view of the head of the Seagull Nebula, which is located roughly 3,700 light-years away from Earth, was captured in this new image from ESO’s La Silla Observatory. Nebulae are among the most visually impressive objects in the night sky. They are interstellar clouds of dust, molecules, hydrogen, helium and other ionized gases where new stars are being born. Although they come in different shapes and colors many share a common characteristic: when observed for the first time, their odd and evocative shapes trigger astronomers’ imaginations and lead to curious names. This dramatic region of star formation, which has acquired the nickname of the Seagull Nebula, is no exception. 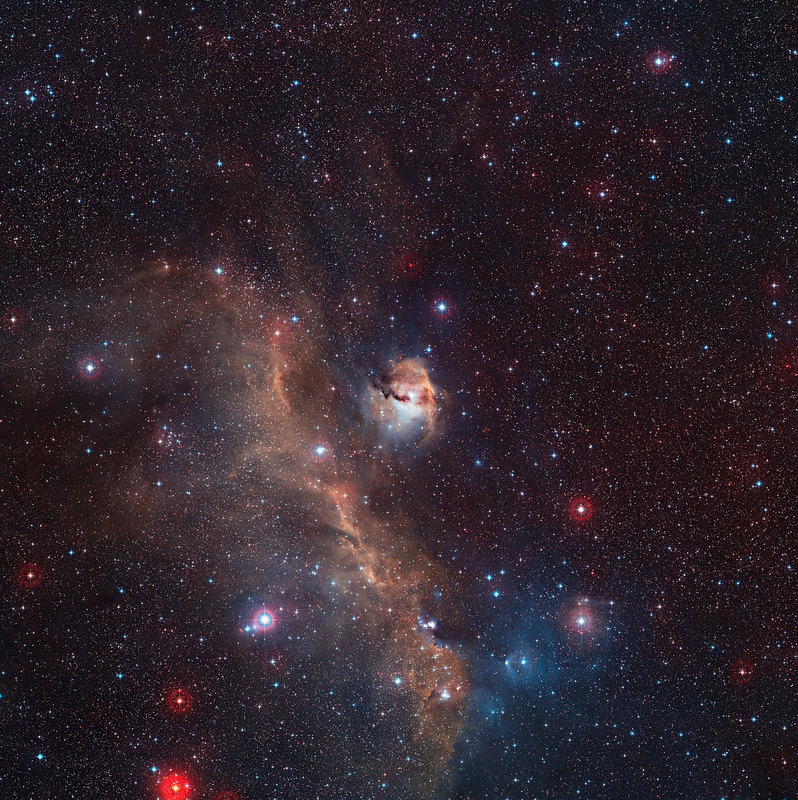 This new image from the Wide Field Imager on the MPG/ESO 2.2-meter telescope at ESO’s La Silla Observatory in Chile shows the head part of the Seagull Nebula . It is just one part of the larger nebula known more formally as IC 2177, which spreads its wings with a span of over 100 light-years and resembles a seagull in flight. This cloud of gas and dust is located about 3,700 light-years away from Earth. The entire bird shows up best in wide-field images. The complex of gas and dust that forms the head of the seagull glows brightly in the sky due to the strong ultraviolet radiation coming mostly from one brilliant young star — HD 53367  — that can be spotted in the center of the image and could be taken to be the seagull’s eye. The radiation from the young stars causes the surrounding hydrogen gas to glow with a rich red color and become an HII region . Light from the hot blue-white stars is also scattered off the tiny dust particles in the nebula to create a contrasting blue haze in some parts of the picture. This object has received many other names through the years — it is known as Sh 2-292, RCW 2 and Gum 1. The name Sh 2-292 means that the object is the #292 in the second Sharpless catalog of HII regions, published in 1959. The RCW number refers to the catalog compiled by Rodgers, Campbell and Whiteoak and published in 1960. This object was also the first in an earlier list of southern nebulae compiled by Colin Gum, and published in 1955. HII regions are so named as they consist of ionized hydrogen (H) in which the electrons are no longer bound to protons. HI is the term used for un-ionized, or neutral, hydrogen. The red glow from HII regions occurs because the protons and electrons recombine and in the process emit energy at certain well-defined wavelengths or colors. One such prominent transition (called hydrogen alpha, or H-alpha) leads to the strong red color. 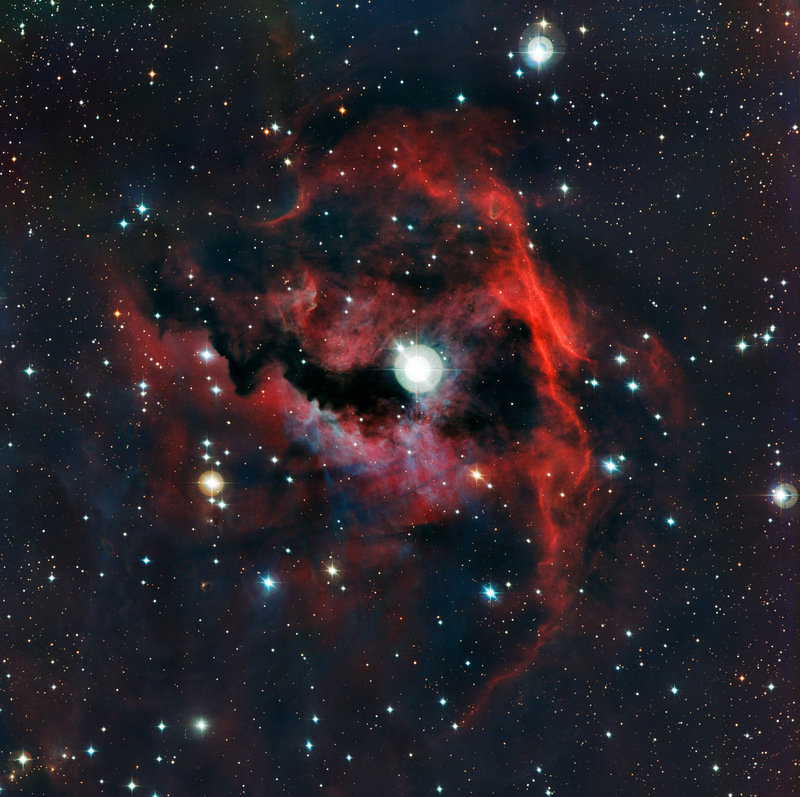 Be the first to comment on "New Image of the Seagull Nebula"